CAGAYAN DE ORO CITY (Mike Banos / 21 Jun) The Laguindingan Airport in Misamis Oriental province in northern Mindanao will be operational by 2010, the Department of Transportation and Communications said following the signing of a memorandum of agreement for the second phase of the airport's relocation site project. "Based on our present implementation schedule, the first air plane is scheduled to land and take off Laguindingan airport by 2010," said Della P. Capicenio, project manager of the DOTC's Laguindingan Airport Development Project (LADP). The agreement, signed on Tuesday, covers the development of the second relocation site for families affected by the LADP in the village of Tubajon in Laguindingan town, as agreed among the affected families, the local government and other agencies involved, and would cover a 6.2- hectare area which can accommodate more than 600 families. 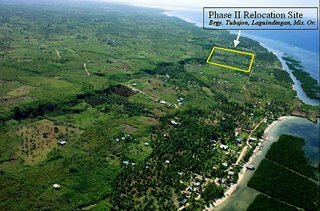 Robert C. Castañares, DOTC Assistant Secretary for Project Planning and Development, said the P33-million budgeted for land acquisition will be transferred next week by the agency to the provincial government of Misamis Oriental which will undertake the actual land acquisition in their behalf. Gov. Oscar Moreno said another P10 million for the relocation of affected residents has also pledged by President Gloria Arroyo during groundbreaking rites held on January 11 at the project site. Moreno said he has been meeting weekly with the inter-agency coordination committee for the project to keep close tabs on the ground work for the P5.6-billion project. Castañares is DOTC's representative to the Cabinet Assistance System (CAS) which meets every Wednesday following the regular cabinet meetings held Tuesdays with Ricardo Saludo, of the Presidential Management Staff (PMS). He said the LADP has been identified by the President as one of the priority projects under her "Pump-Priming Initiatives" and its progress is being monitored every week by the CAS. Financing for the LADP as conceived by the National Development Corporation (NDC) through the Philippine Infrastructure Corporation (PIC) has been found to be "not as workable" as originally planned, Castañares said. Hence, CAS has recommended the project push through as scheduled under the regular DOTC budget. "The LADP will be implemented with or without NDC," Castañares said, adding, the NDC will proceed with its fund-raising initiatives for the project. The national government is undertaking negotiations with the Korean Eximbank to lower the initial payment to the project contractor, given their current budgetary constraints. The LADP will tap multiple fund sources to finance the project, including Korea's Economic Development Cooperation Fund (EDCF, US$16.3-million), EDCF supplemental loan ($8.2-million) EDCF/KEXIM Buyer Credit ($38.9-million), NORDIC Investment Bank Export Credit ($12-million). The GOP will chip in with its counterpart of $32.3-million. "The Eximbank facility will expire this December but we have asked the Dept. of Finance to negotiate for its extension until such time that the LADP needs the funds," Castañares said. As a "tied loan", the Eximbank facility will allow only Korean contractors to participate in the construction, with the possible participation of Filipino contractors as sub-contractors, he added. "However, as a tied loan, it will be considerably cheaper than the prevailing 5-6 percent commercial rate at not more than 3 percent," Castañares said.